Now that some of last week’s frenzy has diminished it seems a good time to share a few updates and also wrap up our polls on what Kate wore during her pregnancy. We begin with our newsbriefs. 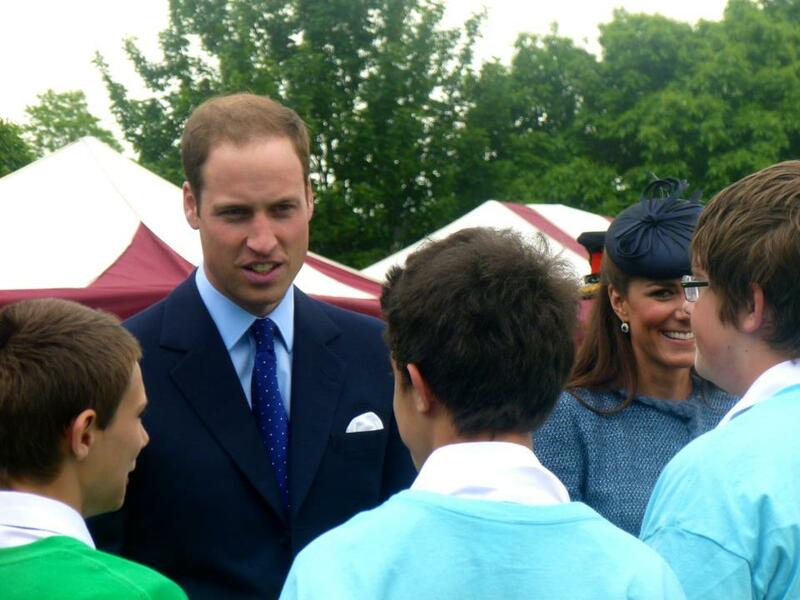 It’s believed Kate, William and Prince George continue their stay in Bucklebury at the Middleton’s 18-acre estate. William has a week+ remaining of his paternity leave before he returns to RAF Valley in Anglesey. There are no formal engagements on the calendar, but there has been chatter about a possible photocall with selected media to allow pictures of the newborn and his parents. An autumn christening continues to be the expectation, after the Queen and Prince Philip return from the couple’s annual two-month trip to Balmoral. The precise location remains unknown; Richard Palmer’s story in the Express offers more information. Prince William was christened in the Music Room at Buckingham Palace and Prince Harry was baptised at St George’s Chapel at Windsor Castle. Those two venues remain a possibility but other options under consideration, according to sources, are the Chapel Royal at St James’s Palace and the Queen’s Chapel across the road. We’ll keep you updated on the plans for this, as well as any other events. 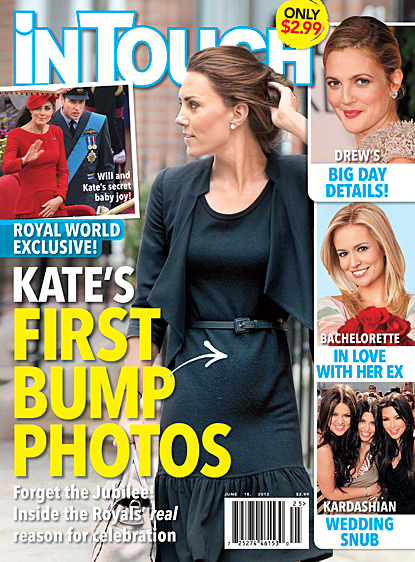 Next, news sure to please those who like to ‘repliKate’ styles seen on the Duchess. An abbreviated lookbook for the Issa-Banana Republic collaboration was released this week, and there are several dresses that will hold appeal. 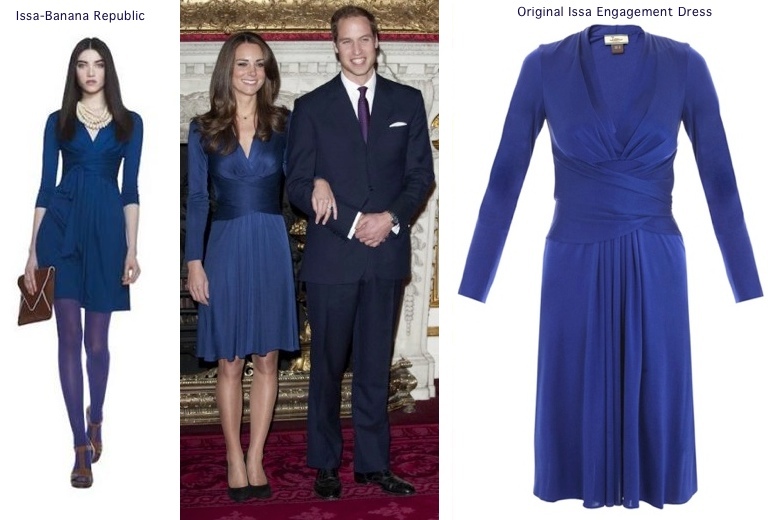 One design sure to delight many, a frock very similar to that now-iconic blue engagement dress. With apologies to those who already read all of this on our WKW Facebook page last Thursday, the Banana Republic version shown above will sell for $130. There are two other dresses in the collection with very similar lines: a short sleeved style in blue and a maroon piece with three-quarter sleeves. Banana Republic released a photo via its Facebook page of Naomi Watts wearing a wrap dress from the line. The collection launches August 8 online and in Banana Republic stores. The marketing thus far includes efforts to capitalize on the Issa connection to Kate. Below, a snippet from an Elle interview with BR’s creative director, Simon Kneen. Below, another image from the BR Facebook page. It’s more-than-unlikely Kate will wear anything from this collection, or any other Issa creation, past, present or future. Not only has the label’s founder, Daniella Helayel, left the company, but prior to her departure she sold a controlling interest in the brand to Camilla al-Fayed. Why should that matter? Because her father, Mohamed al-Fayed, previous Harrod’s owner, has been vocal in his belief the Royal Family is responsible for the death of his son, Dodi al-Fayed, along with Princess Diana. That topic is the subject of a film he financed, Unlawful Killing. In the movie the Queen is referred to as ‘a gangster in a tiara’ and Prince Philip is called a psychopath. Regardless of that baggage, it appears there could be a lot to like in the upcoming collection, with price points sure to please many a pocketbook. To see several more styles, click here to visit She Finds. One other quick shopping update of note: Nordstrom is holding its semi-annual Anniversary Sale, one of the few times I see Aquatalia discounted. 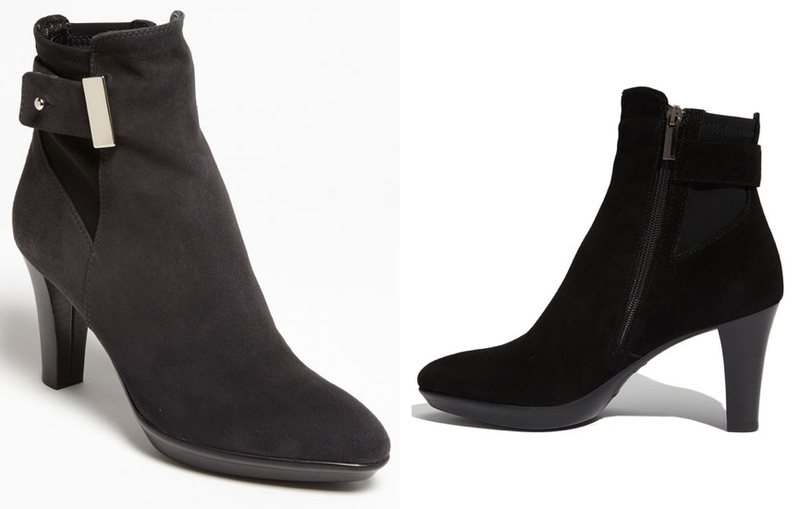 Below, the Royal boot, it is on sale for $298, 25% off its regular price of $398. Sale prices run through August 4. The style is known as the Ruby Dry at Russell & Bromley, where it is priced at £245, roughly $380 at today’s exchange rates. There are other Aquatalia designs on sale, but not all are marked down. Nor do I see Kate’s Rhumba boot available at Nordstrom, known as the Hi & Dry on the far side of the pond . Next, a look at results from those polls that kind of got lost in the shuffle of all the goings-on this past ten days, as well as one final survey to determine the most popular style worn by the Duchess during her pregnancy. I don’t think anyone will be surprised by the look you selected as your favorite for Kate’s first trimester. Capturing almost 24% of your 3049 votes, the runaway winner was Kate’s McQ by Alexander McQueen Black Watch Coat, worn for a visit to her old prep school in November of last year. The blue blue plaid Simyonette coat by Diane von Furstenburg Kate wore when released from the hospital received the second-highest number of votes. Moving to styles seen in Kate’s second trimester, after 2700+ votes the look you liked the most is the By Malene Birger teal coat worn when the Duchess joined HM and Prince Philip for a trip to Baker Street Station this March. In second place, the MaxMara Studio wrap dress worn to Hope House. We divided the voting in Kate’s third trimester into two categories. The first involved pieces worn at formal events where we had clear photographs of what the Duchess was wearing. In this voting you selected the Topshop Polka Dot dress worn for the Warner Brothers Studio in late April. The blue Emilia Wickstead came in with the second greatest number of votes. Our fourth poll included looks worn on occasions when we had poor photos, or none available that I could license for the site. 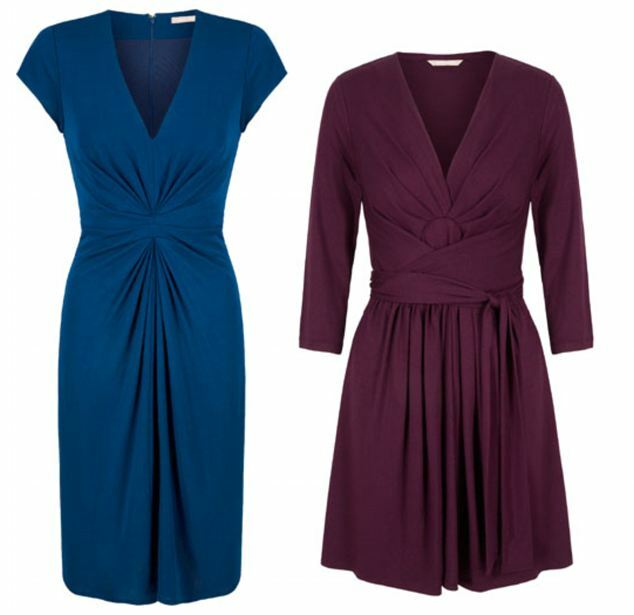 The big winner in this case is the Séraphine Wrap Dress with Tie. We have combined these four ensembles into our final poll on Kate’s maternity style. Here are visual reminders of your top choices, beginning with the McQ Black Watch coat and Aquatalia boots. Kate in her By Malene Birger coat and Whiteley hat. The Topshop Polka Dot dress and Ralph Lauren jacket. And the Seraphine Wrap Dress with Tie as seen (barely) on the cover of Australia’s Woman’s Day magazine (photo is in lower left corner of magazine). Today’s final note, a mention of our current Baby Cambridge Fundraising auction currently underway on eBay. 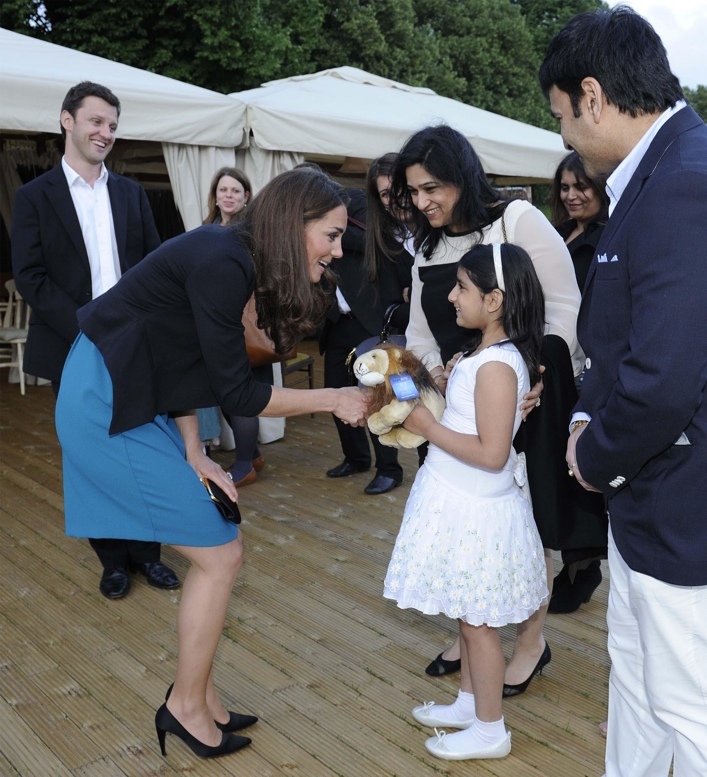 All proceeds from the auction go directly to one of Kate’s patronages, EACH (East Anglia’s Children’s Hospices). This is an amazing auction, with a bit of a twist for us (the four bloggers running the Fundraiser): we are showcasing items and brands Kate’s younger sister is fond of, although they are sure to hold equal appeal for anyone who enjoys beautiful jewelry and elegant apparel! The auction includes a dress not even available for purchase yet from a brand Pippa is frequently seen wearing, Logue London. The garment is 100% silk jersey, crafted in a shirtdress style that is part of the label’s upcoming fall/winter collection. Also part of the auction, an item that is available now and something Pippa has been seen wearing: the Peapod Necklace by jeweler Argent of London. The third item is an autographed copy of Pippa’s book “Celebrate”. This copy is actually signed by Pippa herself, originally purchased from a stock signing at Foyles for Books, and kindly donated by Pippa-Middleton.co.uk. 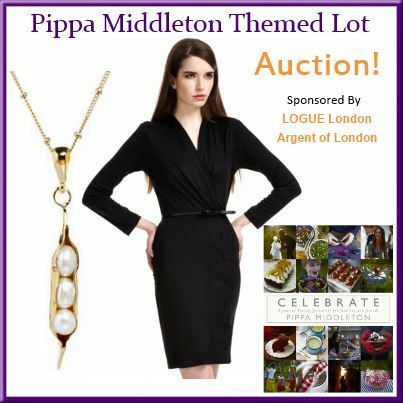 We want to thank Carly of Pippa Middleton Style, along with Argent of London and Logue London for their generous donations! We are making great progress, as of this evening (Saturday, July 27) more than $6100 has been donated via our Just Giving page. Thank you to everyone who has so generously donated thus far. Kate surprised us with a Friday night appearance on behalf of The Art Room, one of her patronages. 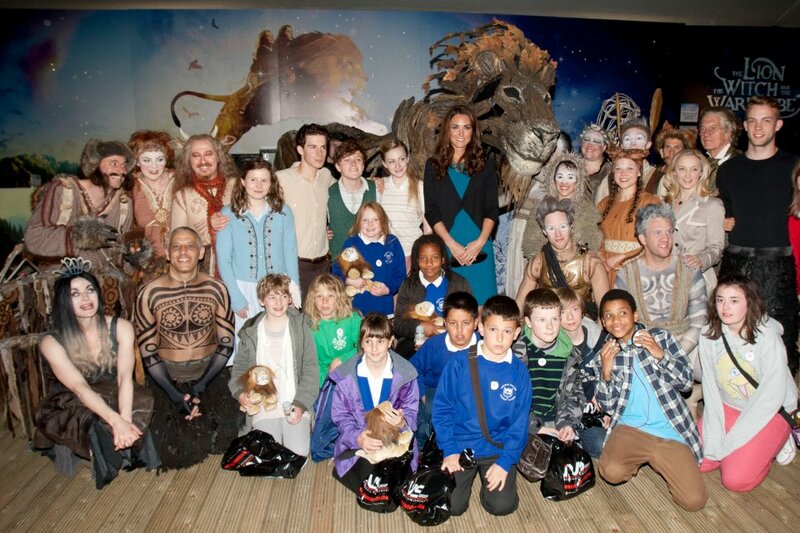 The Duchess attended a performance of The Lion, The Witch and The Wardrobe at Kensington Gardens. She was joined at the performance by more than 150 children from schools in London and Oxford, the Art Room uses the arts as therapy for children with emotional and behavioral challenges. 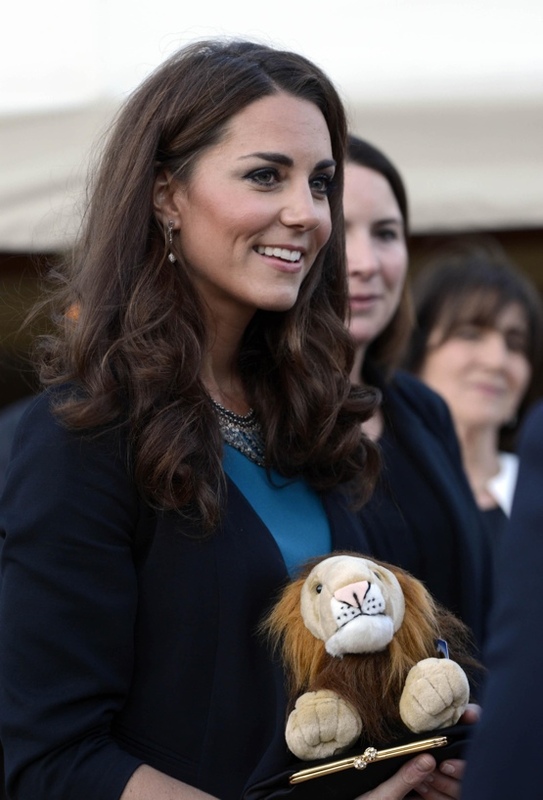 Here we see little Suhani Kapoor giving Kate an Aslan lion stuffed animal. 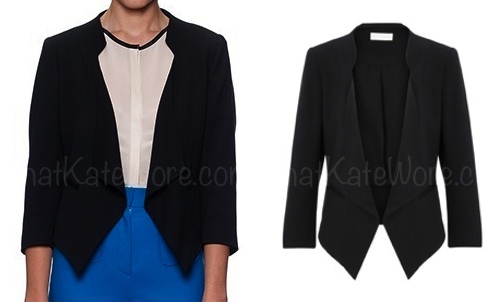 Kate wore the Helena Blazer by Whistles. The piece is navy, with a waterfall-style front and three-quarter sleeves. This is the same jacket seen on Kate with the silly In Touch cover story of last week, we want to thank WKW Facebook friend Hannah, she noted this was the jacket last week when the magazine came out. The Duchess of Cambridge enjoyed a secret trip to the theatre last night – leaving her husband at home, like millions of men, watching the football. 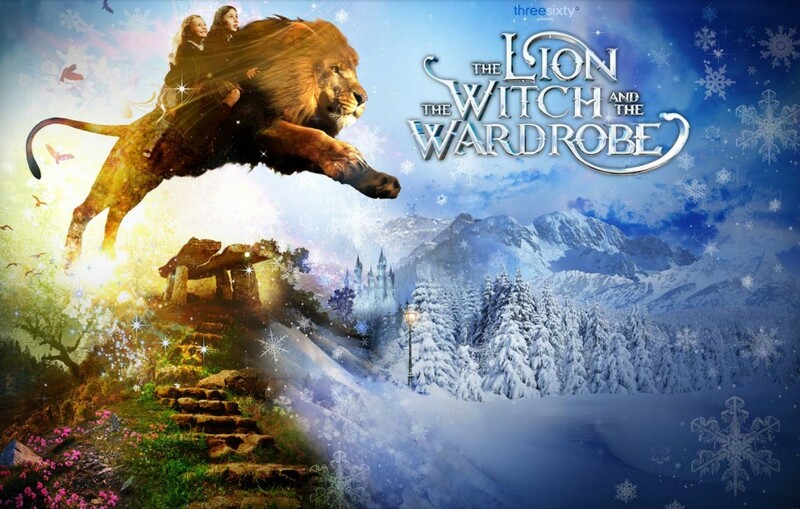 While Prince William sat in front of the television at Kensington Palace with a few beers glued to England’s European Cup match, Kate was taking 150 children from one of her charities, The Art Room, to see a production of The Lion, The Witch and The Wardrobe. Rebecca also shared some of her photos from the event on Twitter. Kate’s dress tonight was by Zara, some believe it is the same frock previously worn by Pippa Middleton, but I don’t think that is the case. When we know which dress it is we will update the post. This angle provides a better look at the back of the dress. 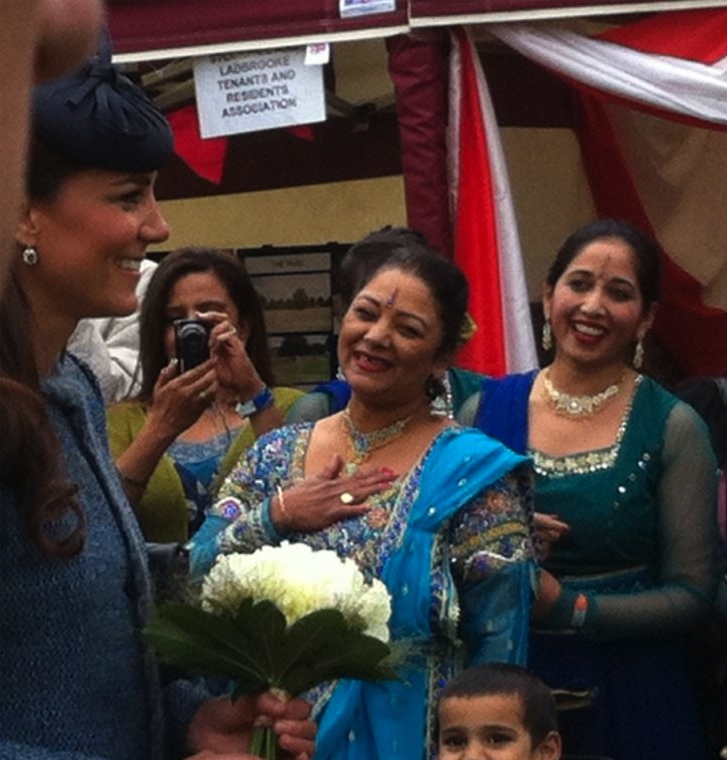 During the interval the Duchess chatted animatedly with the children about what they had seen in the first half. ‘Did you see all the animals on stilts and wasn’t Lucy cute?’ she asked. 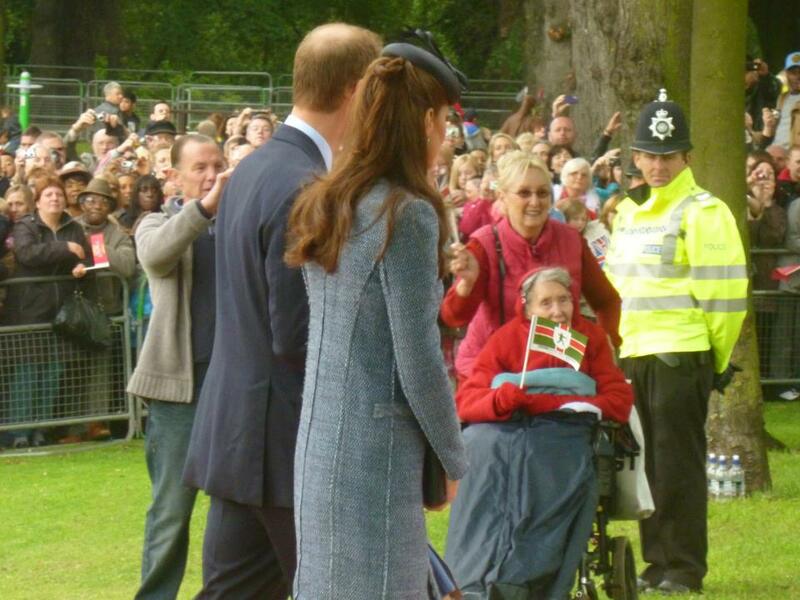 Kate looked like thoroughly enjoyed herself. 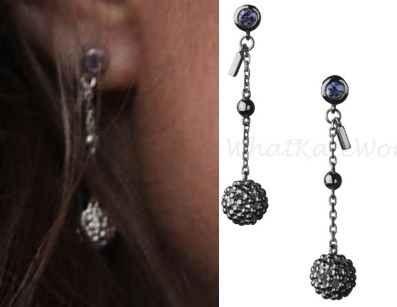 No doubt many will recognize Kate’s Links of London Effervescence Bubble earrings. Kate also wore an elaborate necklace. â€œWhat I want to know is has anyone tried Turkish Delight?â€ Kate asked the group of kids, referring to the sweet treat in C. S. Lewisâ€˜s famous book. She also carried her Anya Hindmarch Maud clutch and Prada pumps. 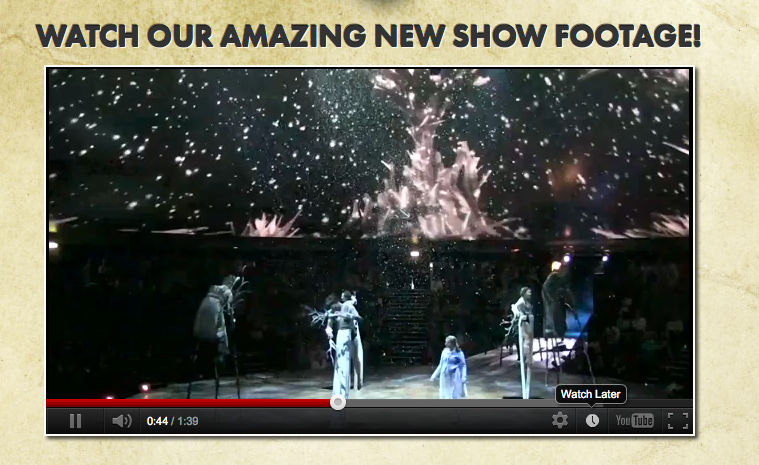 The show is a favorite for many, the CS Lewis tale. It is being done in a new facility, the ThreeSixty Theatre in Kensington Gardens Park. It looks like a fabulous venue and amazing production. We’ll see you tomorrow for Trooping the Colour. “The Duke and Duchess of Cambridge are set to return to Scotland in July, as they accompany the Queen on her Diamond Jubilee engagements. Kate and William, or the Earl and Countess of Strathearn to use their Scottish titles, are particularly looking forward to a special service being held in Edinburghâ€™s St Gilesâ€™ Cathedral… when William will be formally installed as a Royal Knight of the Thistle. We will share more details when we have them. I was at the Vernon Park event today. 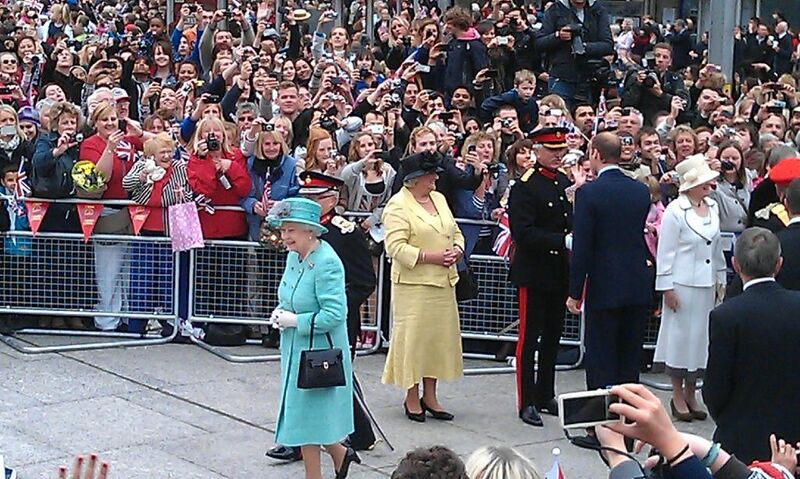 I got great views of the Queen, William and Kate, despite the crowds. 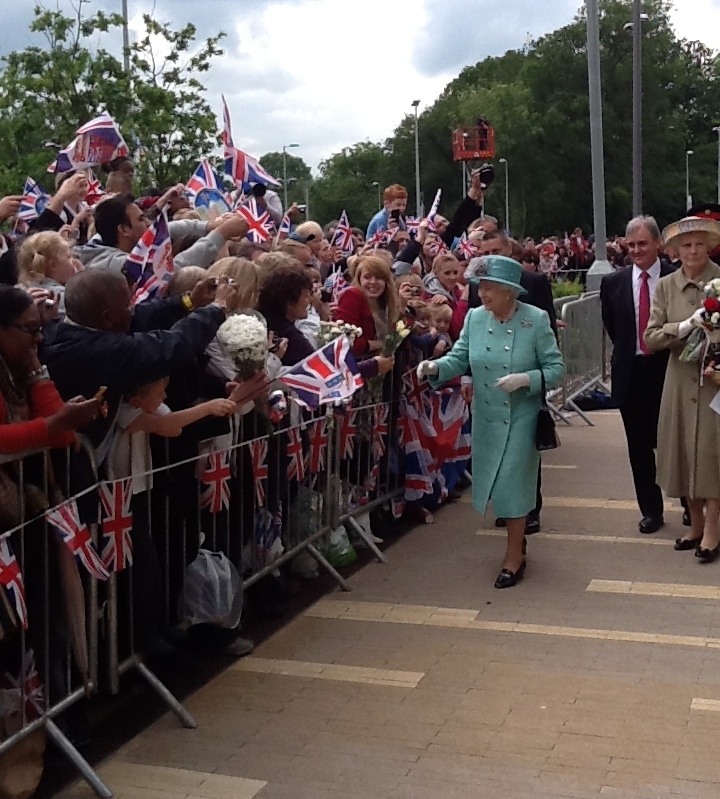 Here is one of her wonderful pictures, HM arriving at the Park. Generous Courtesy of "Jess and the Rebels"
She was extremely chatty with everyone she met, and they got delayed a few times because of this, which was quite funny. The nicest moment I saw was when she broke away from the group to briefly greet an elderly spectator in a wheelchair behind the barrier near me. Kind Generosity of "Jess and the Rebels"
Jessica also has outstanding photos of Prince William. This one is cute, Kate almost looks mischievous. Our thanks to Jessica for being so gracious in sharing her impressions and her photographs from yesterday, she also has a delightful blog, “Jess and the Rebels,” pop in for a visit to read about her adventures traveling the world. 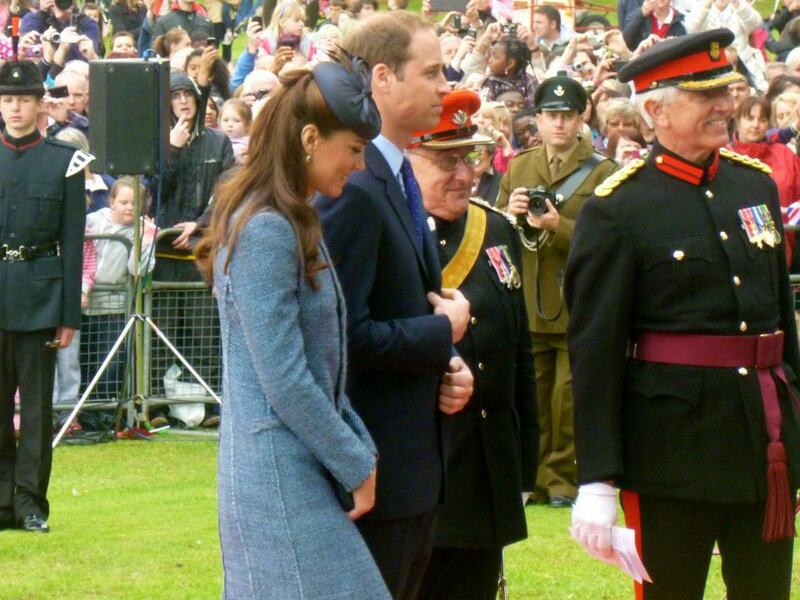 The Queen’s Jubilee Tour was in Nottingham today, Prince William and Kate accompanied HM on the visit. 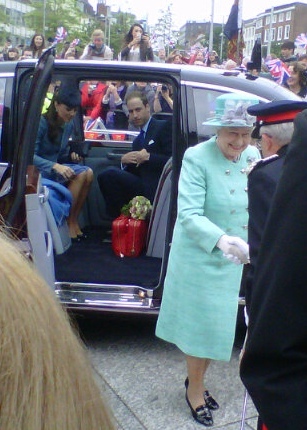 William and Kate actually drove up from Anglesey for the appearance. Below we see HM being greeted, the Duke and Duchess are about to step out of the car transporting them from the train station, where they met up with the Queen. Unfortunately the Duke of Edinburgh was not able to join the group as originally planned, he continues to recover from an infection. 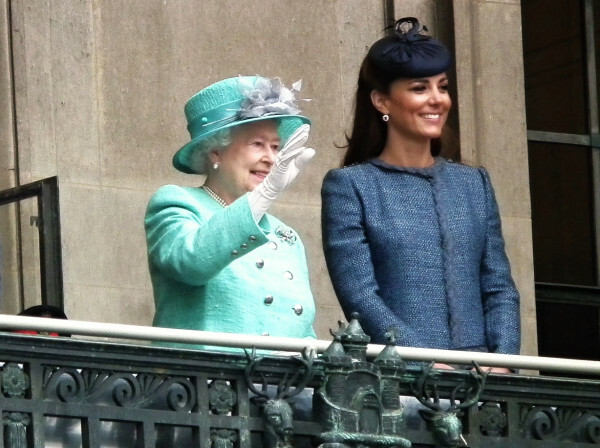 The Queen wore a lovely silk tweed Stewart Parvin coat and dress in a rich aqua. The crowds were enormous in Old Market Square. 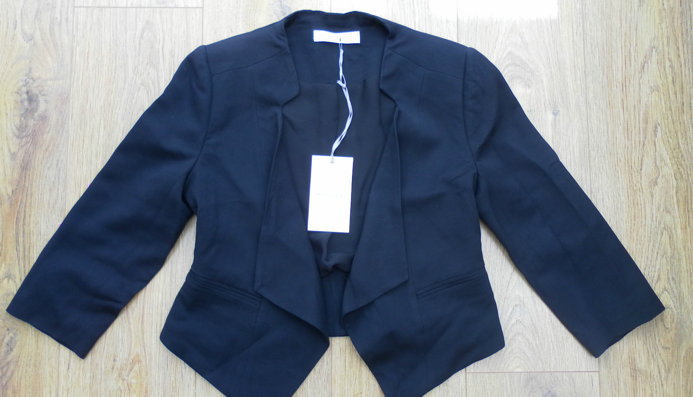 Some may recall this is a piece Kate purchased at the Bicester Village outlet mall. 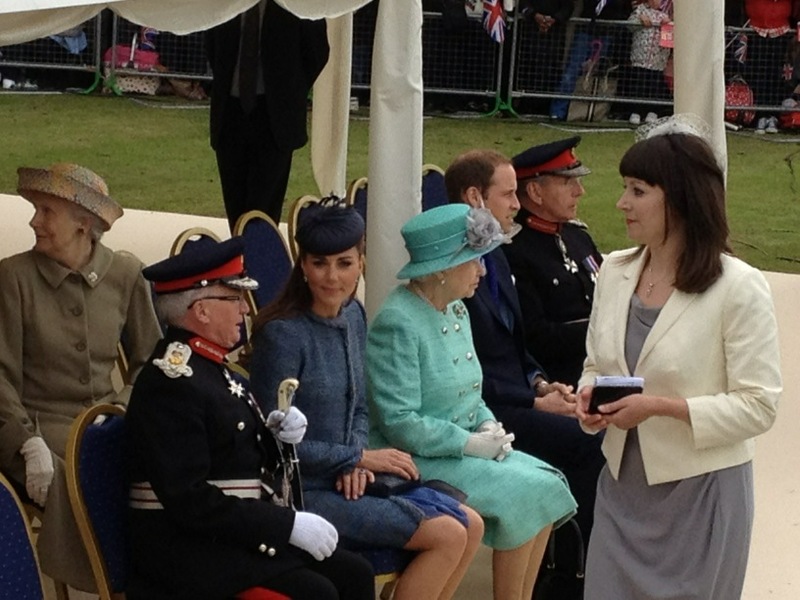 Another look at Kate and the Queen via Esmik D’Aguiar’s Twitter feed. 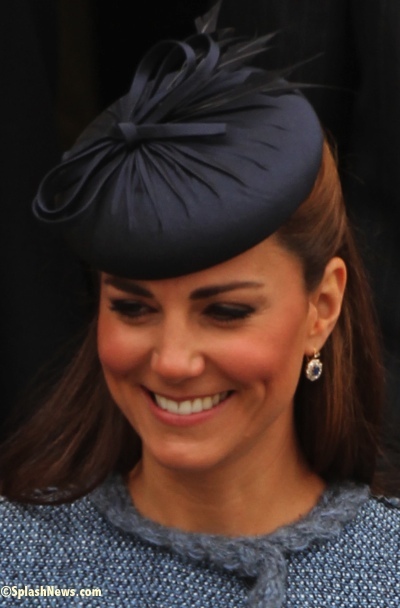 Kate’s hat was seen for the visit she and William made to the Irish Guards last year on Armed Forces Day. (Our post on that is here.) The piece is by Rachel Trevor-Morgan, a royal favorite. No doubt some will recognize Kate’s diamond and sapphire earrings, the pair we believe were re-fashioned from a pair of Princess Diana’s earrings. She also wore her blue Zara dress underneath the tweed coat, this is at least the fourth time we’ve seen that garment. Many of the day’s activities were at Vernon Park. … it was back to the day job for the monarch who unveiled a plaque at Vernon Park in Basford to mark a Fields in Trust project, which preserves parks as recreational spaces, during the first leg of her two-day visit to the East Midlands. 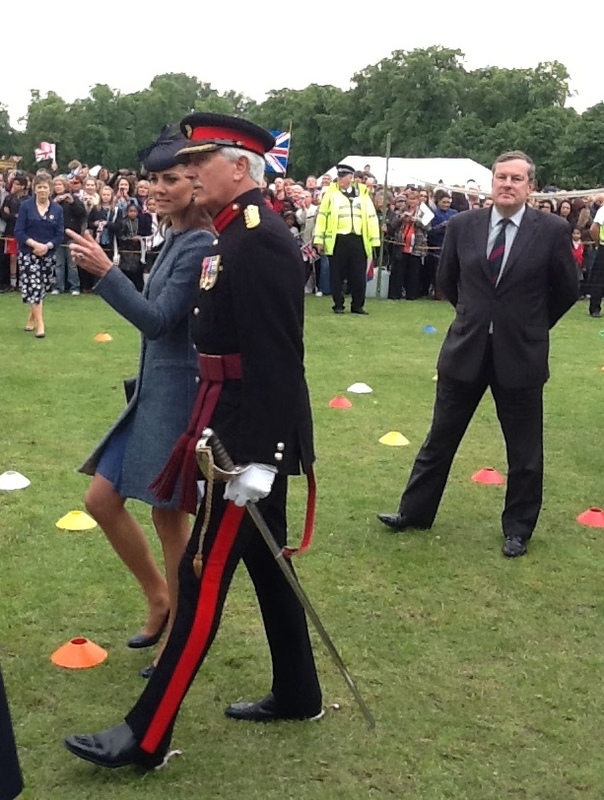 The royal party then travelled to Vernon Park, where the prince made his official jubilee tribute. 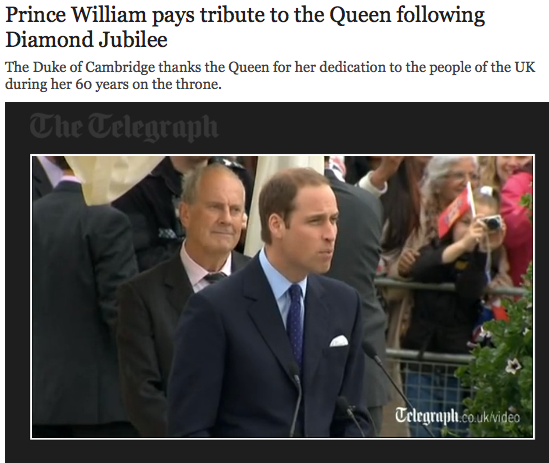 He said: “The occasion presents the perfect opportunity for me, through my patronage of the Queen Elizabeth II Fields, to pay tribute to the Queen on her Diamond Jubilee. “On behalf of Fields in Trust, thank you so much Your Majesty and the Duke of Edinburgh for everything you have done throughout your reign to protect these vital outdoor places for the nation. Here we see the group at the park, with thanks to CNN’s Max Foster for his wonderful photos. 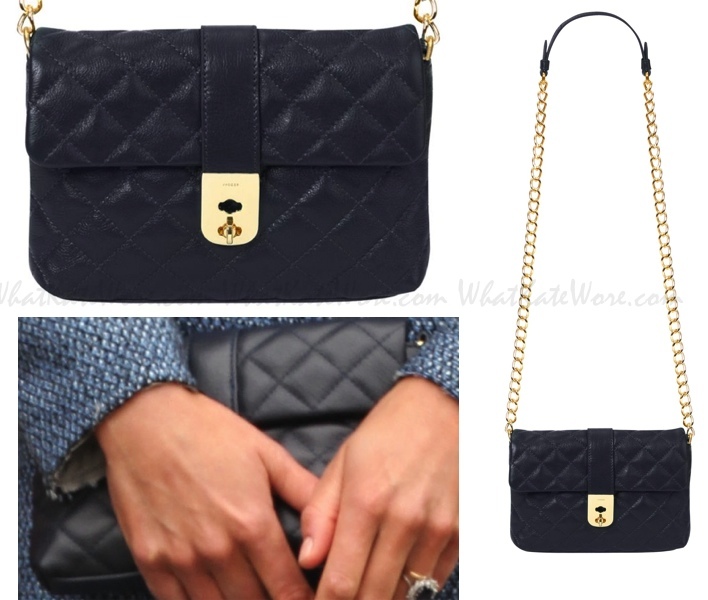 The Duchess carried the Jaegar ‘Kate’ bag, with thanks to WKW Facebook friends Kate Spotter and Carolin for the quick ID, the bag originally sold at Jaeger sold for Â£150, it is now sold out. 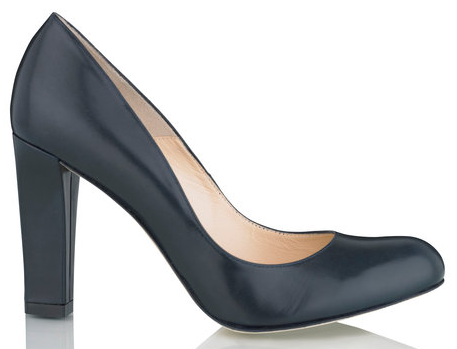 She also wore her LK Bennett ‘Art’ pumps, initially seen for the couple’s visit to Darwen Academy, most recently worn for Kate’s visit with the Olympic hockey team in March (our story is here). Another look at the group assembled for the official presentations, our thanks again to CNN’s Max Foster. 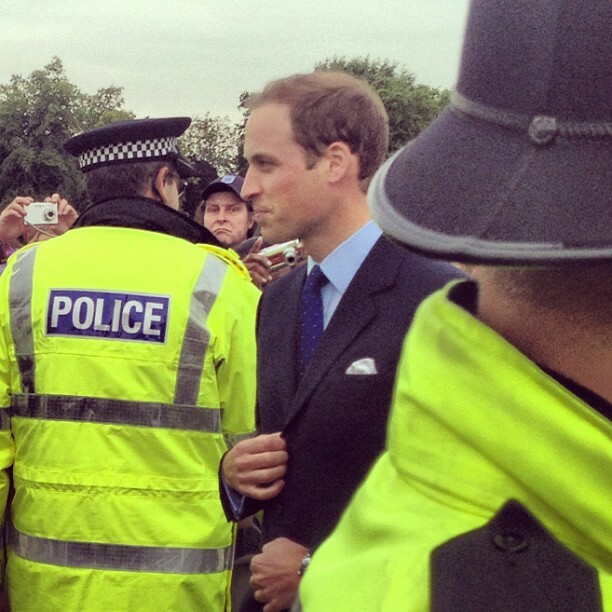 Prince William during the walkabout, with thanks to jasminbahia’s Instagram feed. 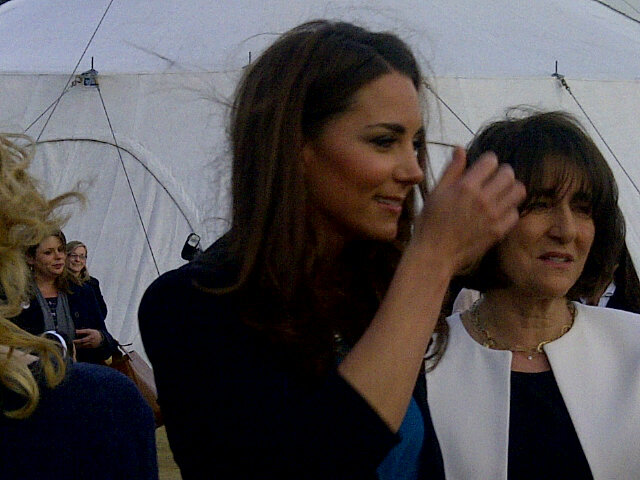 And a side look at Kate’s partial updo, again with thanks to Jasmin Bahia. 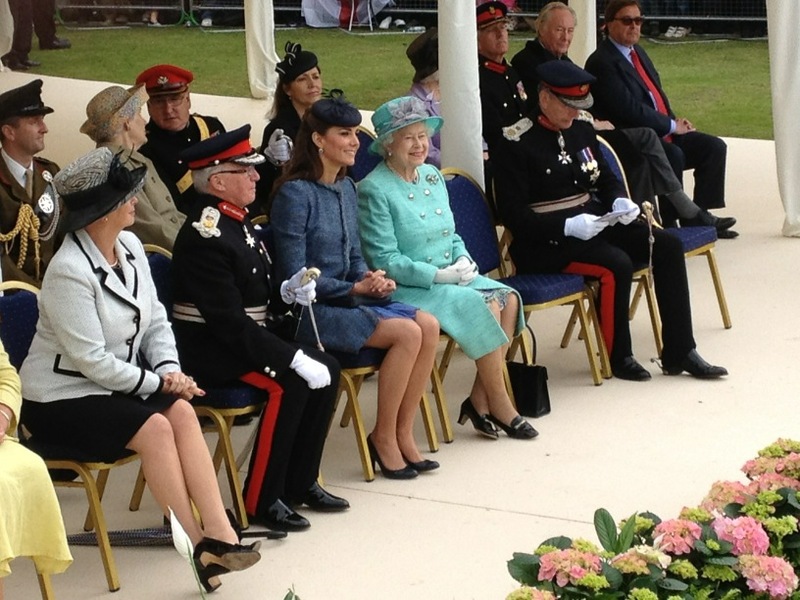 This also gives you a slight perspective of what Kate is looking at when at a function of this kind. 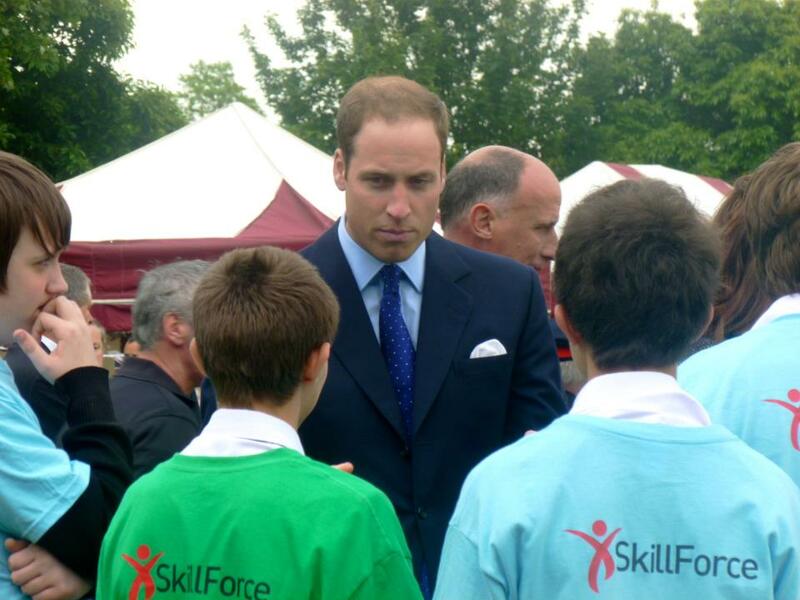 Some shared their delight at meeting the royals via Twitter. 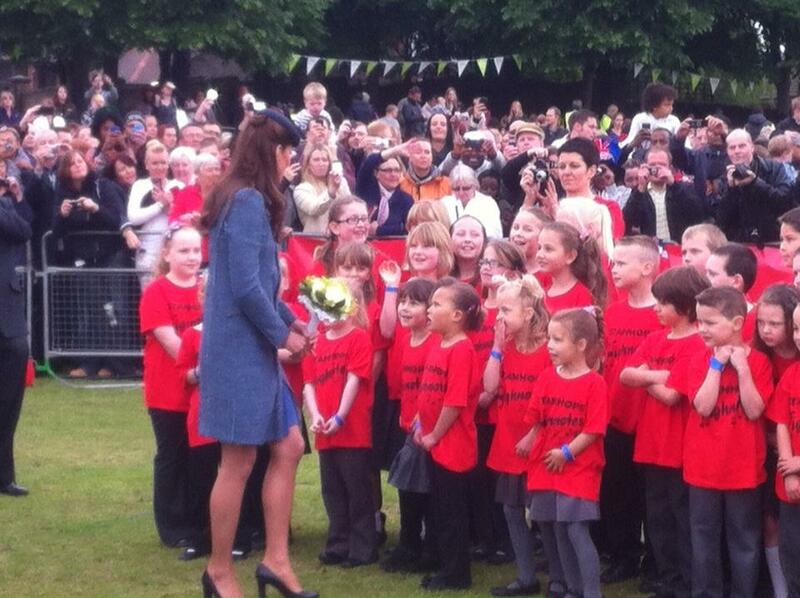 Here we see Kate chatting with some of the thousands who came out for the event. Among those on hand, the Nottingham Scouts, they formed part of the welcoming group at Old Market Square and inside the Council House, in addition to help out at the park, the group shared this photo. 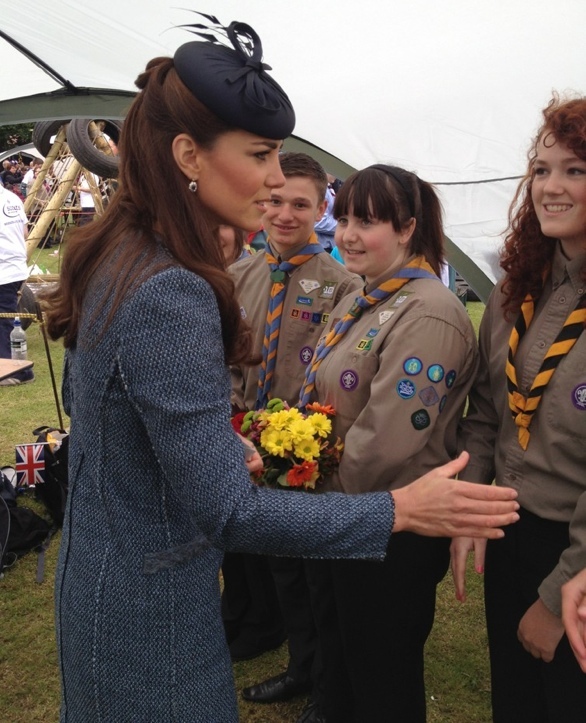 Kate also helped the Scouts put up a tent. And with thanks to WKW Facebook friend Misty for the tip, probably the cutest video of the day from ITN is the one titled “Royals: William & Kate Greet Queen on Arrival in Nottingham,” click here to get to ITN’s main royal video page and scroll down for this story, you’ll love it. 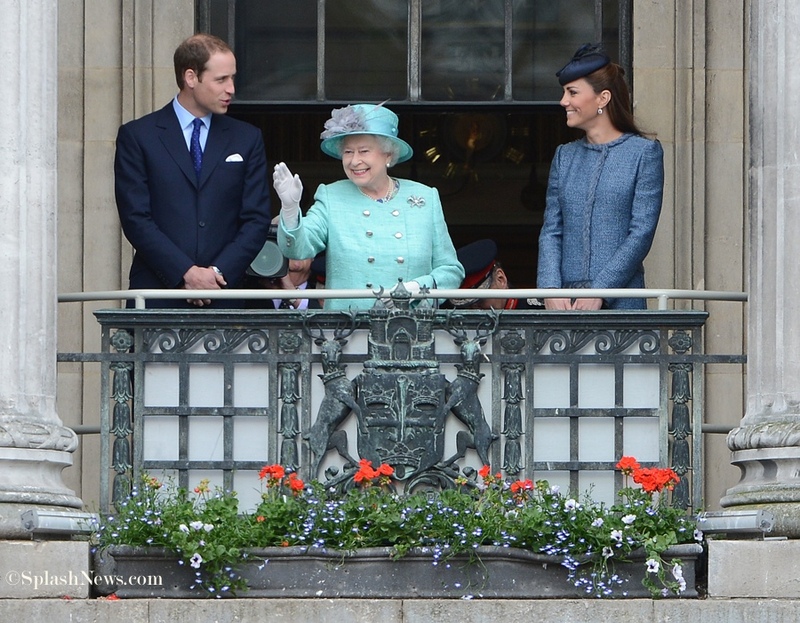 It looked like a wildly successful visit for the Queen, as well as William and Kate. The Duchess looked lovely while also demonstrating through her understated ensemble that she has no interest whatsoever in trying to upstage HM. A reminder that Trooping the Colour is this Saturday, that is the next time we expect to see Kate, as well as other royals. We want to share a few updates before tomorrow’s Jubilee visit to Nottingham, as well as an updated itinerary for that trip. 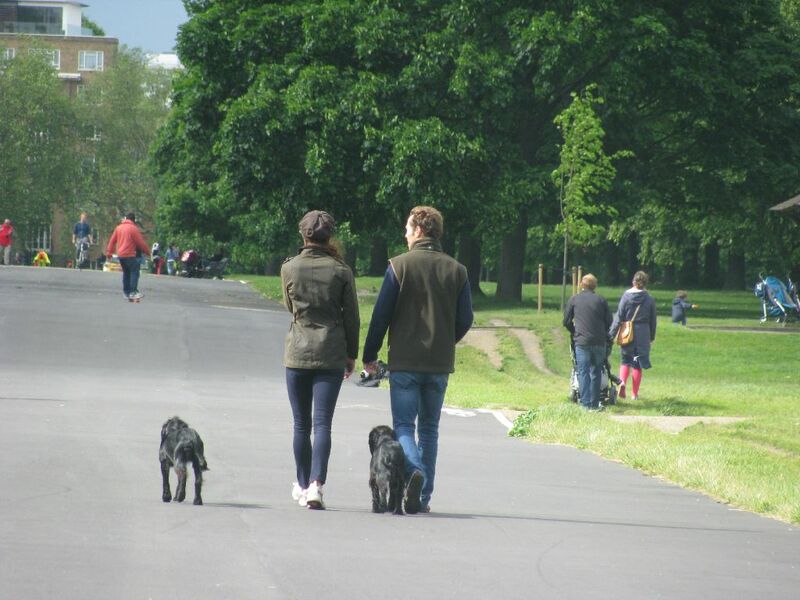 Last Friday Kate and her brother James took Lupo and Ella (we believe it is Ella, the Middleton’s dog and Lupo’s mother) for a stroll in Kensington. Canadian journalist Jocelyn Laidlaw saw the pair and took a photo, sharing it via her Twitter account. Ms. Laidlaw says she also has a video, that has not yet been posted. 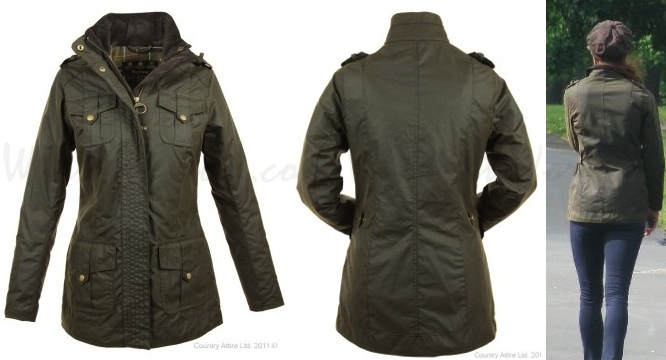 Kate wore her familiar Barbour, the waxed Ladies Defence Jacket. It remains out of stock at Country Attire, but Joseph M. shows it in stock at £119.94, about $190 USD at today’s exchange rates. Kate was also in her skinny jeans and sneakers/trainers. On Thursday night Kate and William went to see one of the summer’s hottest movies, “The Avengers” at a theater in Kensington. A young lady also seeing the movie, Hessa Magunda, tweeted her excitement. Because this is one of those times we believe the couple had every right to expect privacy we aren’t posting the photo someone snapped with their camera phone, but we can tell you what Kate was wearing. Kate looked to be in her J Brand 811 skinny jeans, seen on many occasions, as well as a black top or sweater, and a black gilet (vest) over the top. 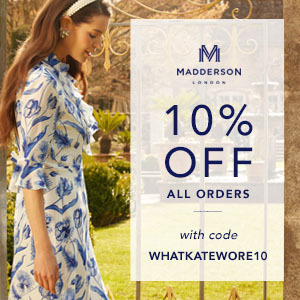 We believe Kate wore a piece she thought about, or perhaps even planned on wearing to the Jubilee concert last Monday. When the Palace originally released the information on what Kate wore, the message was that it was a “black shearling Alice Temperley coat over a patterned blue and purple dress from Whistles”. However, shortly after the original announcement a change was made to say Kate was wearing a McQueen jacket. With thanks to Kate in Waiting, here is what we think The Duchess was wearing, the Temperley Leather And Shearling Contrast Gilet, we show it in a different color as seen at Flannels. Again, Kate’s was black. We also show detail of Temperley’s Sofia coat because it has very similar detailing, offering an idea of how the trim looks in black. 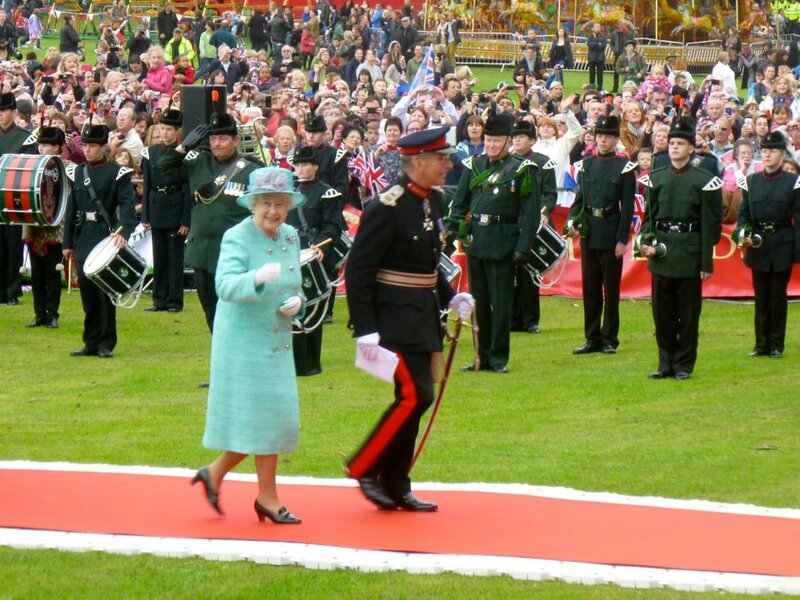 The Royal Party will arrive at Vernon Park along Vernon Avenue at approximately 11.00 am for a re-dedication of Vernon Park under the auspices of the QE2 Fields in Trust organisation, of which Prince William is patron. City officials are understandably excited about the visit. 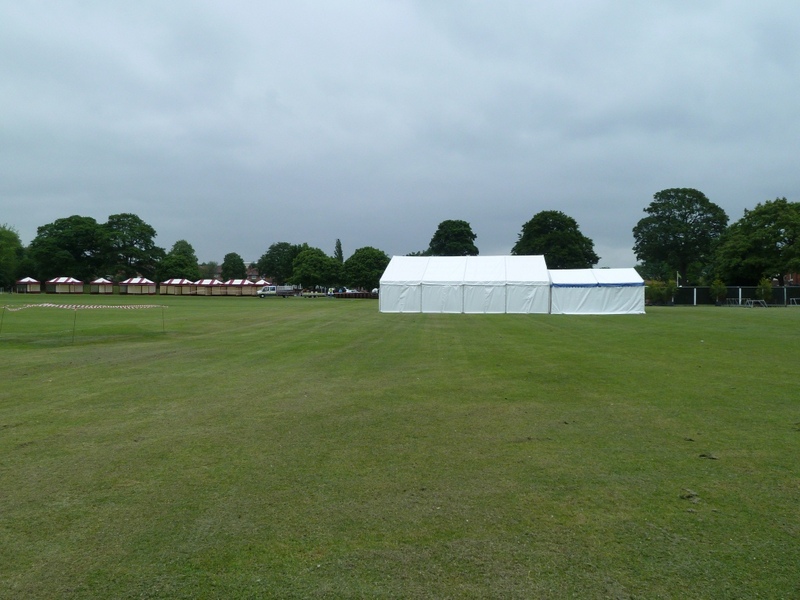 Below we see an image of Vernon Park taken this afternoon, as shared by Fields in Trust, working hard getting everything ready for tomorrow’s visit. Fields in Trust is the only UK-wide charity dedicated to protecting and preserving outdoor spaces, thus the import of Vernon Park being granted its new status, it will be protected and preserved for future generations.